- Swaaaami!!! La la la la laaaaa!! Sanjay also changed the settings where no one (except moderators) can view any of the posts (past or present). 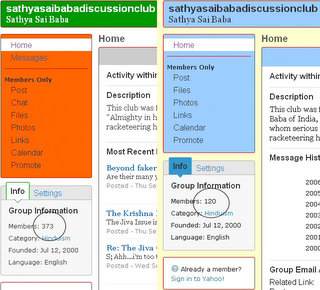 These actions, by Sanjay, pushed the Group's ranking from position 6 to position 29 on Yahoo's Group Rankings For Sathya Sai Baba (which is ranked according to number of members belonging to the group). Way to go Sanjay! These actions also (thankfully) prevent the general public from viewing the filth, slime and defamations that Anti-Sai Activists have been propagandizing for years. Once again, way to go Sanjay! Needless to say, Sanjay's compulsive need to be in control is just more proof of the type of secretive, slimy and sleazy tactics that he utilizes to do damage control and prevent others from reading his looney, weird and equivocal rantings. However, I have some bad news for Sanjay: I saved all the posts I wanted to save when I had the chance to. Foresight has been the greatest weapon against Anti-Sai Activists. I knew, sooner or later, that Sanjay would either directly moderate or take over Afshin's Yahoo Group. I was right. Anti-Sai Activist's pattern of deception and deceit has made them very vulnerable and very predictable. I even know what Sanjay's next move is going to be. For background information, at one point I was a member of Afshin's Yahoo Group and made a single post (Ref) that was promptly deleted. See For Yourself. Of course, the typical excuse given for deleting my post was that links promoting one's website were not allowed. Nevertheless, when links to Sanjay's blog or Anti-Sai Sites were posted, those links were allowed. Although I never made any other posts on this group, I was eventually banned from the group without being given any reason whatsoever. Of course, all of this goes to show how Anti-Sai Activist's are running scared, are trying to cover their tracks and operate on the premise of suppression and soviet-style control. Sanjay is an egotistical control freak who continually seeks to quash and quieten the voices of opposition to the Anti-Sai Movement. Sanjay succeeded in quashing the voice of devotees and proponents on Jody Radzik's Guruphiliac Blog and on Afshin's Yahoo Group. Sanjay attempted and failed to quash my voice on GaudiyaDiscussions.com and succeeded in getting me banned (for no reason) on the GaudiyaRepercussion.com site (which Tapati McDaniels is now having to suffer her "Sanjay-Repercussions" for doing). Sanjay also ceaselessly attempts to dictate to others what they should and should not post on the SSB2 Yahoo Group and on the QuickTopic forum. Sanjay has much to fear and with good reason. The more Sanjay tries to quieten the voices of opposition, the more we succeed in getting our voices heard. Before I published this blog entry, I emailed Lisa with 2 predictions about what Sanjay would do once this blog entry was published. Needless to say, within an hour of publishing this article, Sanjay is now permitting members to view past and present posts on the sathyasaibabadiscussionclub Yahoo Group. This was one of the predictions I made. The second one has yet to be fulfilled. Once it is, I will have Lisa publish the email I sent her and I will also publish my predictions here as well. As I said before, Sanjay (the Anti-Sai Clown) has become very predictable!